It’s Women’s History Month, so here’s another Hypatia article! I’ve posted several in the past two years and put this one off, because it’s such a tricky one. As anyone who has studied Hypatia knows, there is little out there in the way of primary sources. Only a few pages come down to us from those times and almost none can be attributed to Hypatia, except a couple of technical works on mathematics and astronomy. 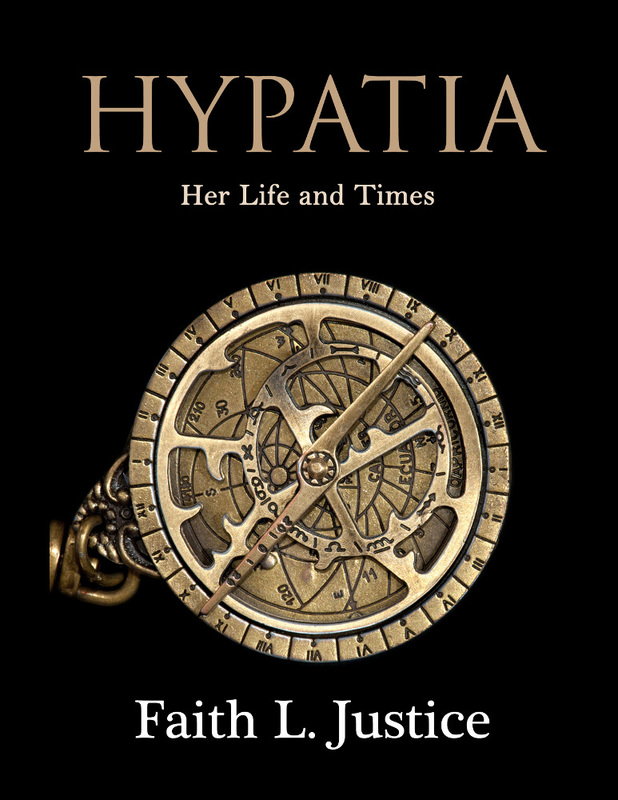 (See my earlier post “Hypatia: Great Mathematician or Geometry Teacher?”) We don’t have much to go on; no diaries, no letters from her, nothing to tell us in her own words what her life was like. We have to rely on the witness of others. So who are these people and what ax did they have to grind (if any) in writing about Hypatia? For all those Hypatia fans out there, I’ve reviewed the four most extensive, and most quoted, primary sources and summarized what historians have generally come to believe about the motives of the authors. For organization’s sake, I’ll go chronologically, starting with one of my favorite characters from Hypatia’s story: Synesius of Cyrene. I salute you, and I beg of you to salute your most happy comrades for me, august Mistress. I have long been reproaching you that I am not deemed worthy of a letter, but now I know that I am despised by all of you for no wrongdoing on my part, but because I am unfortunate in many things, in as many as a man can be. If I could only have had letters from you and learnt how you were all faring – I am sure you are happy and enjoying good fortune – I should have been relieved, in that case, of half of my own trouble, in rejoicing at your happiness. But now your silence has been added to the sum of my sorrows. I have lost my children, my friends, and the goodwill of everyone. The greatest loss of all, however, is the absence of your divine spirit. I had hoped that this would always remain to me, to conquer both the caprices of fortune and the evil turns of fate. We will never know why Synesius received no more letters from Hypatia. Did her letters go astray? Did she want to shield her devoted student from her own troubles? Her silence obviously broke his heart, but his final letter to her still expressed love and admiration for his “mother, sister, teacher, and withal benefactress.” He died in 413, two years before his adored teacher. Writing 25 or more years after Hypatia’s murder, Socrates of Constantinople (b. 380, d.?) wrote a history of the Church covering 305 – 439 in an effort to continue the work of Eusebius of Caesarea. Little is known about Socrates. He referred to himself as a member of the mainstream church (probably a lay member) and dealt evenhandedly with the “heresies” of the Novatians and Arians in his history, avoiding hyperbolic titles and language. He tells us, in his preface, that his teachers were the pagan grammarians Helladius and Ammonius who came to Constantinople, fleeing the 391 destruction of the Serapeum in Alexandria. …Hypatia, daughter of the philosopher Theon, who made such attainments in literature and science, as to far surpass all the philosophers of her own time…For all men on account of her extraordinary dignity and virtue admired her the more. Yet even she fell a victim to the political jealousy which at that time prevailed. For as she had frequent interviews with Orestes, it was calumniously reported among the Christian populace, that it was she who prevented Orestes from being reconciled to the bishop. Some of them therefore, hurried away by a fierce and bigoted zeal, whose ringleader was a reader named Peter, waylaid her returning home, and dragging her from her carriage, they took her to the church called Caesarion, where they completely stripped her, and then murdered her with tiles. After tearing her body in pieces, they took her mangled limbs to a place called Cinaron, and there burnt them. This affair brought not the least opprobrium, not only upon Cyril, but also upon the whole Alexandrian church. And surely nothing can be farther from the spirit of Christianity than the allowance of massacres, fights, and transactions of that sort. Damascius (b. 458, d. 540), also known as “the last of the Neoplatonists” was a pagan philosopher and the last head of the School of Athens, which Emperor Justinian closed in 529. He was born in Syria, but spent twelve years in his early youth in Alexandria studying and teaching rhetoric. Philosophy soon caught his attention and he studied under Hermias and his sons. He then travelled to Athens to study math, science and philosophy. There he met and became great friends with Isidore and later wrote his biography which contains a short piece on Hypatia. Hypatia’s style was like this: she was not only well-versed in rhetoric and in dialectic, but she was as well wise in practical affairs and motivated by civic-mindedness. Thus she came to be widely and deeply trusted throughout the city, accorded welcome and addressed with honor. Furthermore, when an archon was elected to office, his first call was to her, just as was also the practice in Athens…Now the following event took place. Cyril the bishop of the opposite sect was passing Hypatia’s house and noticed a hubbub at the door, “a confusion of horses and of men,” some coming, others going and yet others standing and waiting. He asked what was the meaning of the gathering and why there was a commotion at the house. Then he heard from his attendants that they were there to greet the philosopher Hypatia and that this house was hers. This information gave his heart such a prick that he at once plotted her murder…. Damascius’ work provides historians with some minor problems. Writing more than 100 years after the fact, he has no personal access to eye witnesses, although written accounts were probably available. He wrote the book while living in Alexandria and had access to any generally known stories about Hypatia, which might have provided the new anecdote. As a pagan persecuted by a Christian emperor, Damascius could be forgiven for having a bias against Christians. In evaluating his contribution, we also have to take into account the garbled versions from Photius and the Suda. We don’t have access to the original, but several scholars over the years have tried to reconstruct Damascius’ narrative using those and other extant materials. What comes down to us is similar to the story given by Socrates Scholasticus—Hypatia is a learned woman, esteemed for her knowledge and behavior—but Damascius leaves out the political overtones leading up to her death. In the version we have of Damascius’ work, Cyril is a jealous instigator of murder and the men who did the deed “laid upon the city the heaviest blood-guilt and the greatest disgrace.” What is unique about the work is the insight into Hypatia’s feelings via the menstrual rag anecdote. John, an Egyptian Coptic bishop, wrote an ambitious Chronicle ranging from Adam to the Muslim conquest of Egypt (a generation before his time) which includes a passage on Hypatia (Chapter LXXXIV, Pars. 87-103). The Chronicle comes to us by a convoluted route. It was most likely written in Greek with some Coptic Egyptian inclusions, but the original did not survive. An Ethiopic manuscript, translated from Arabic came to light and, in 1916, this was translated into English. (Full English translation can be found here.) Most historians agree it follows the Byzantine chronicles closely, but it is most important for some additional material particular to Egypt and the Muslim invasion in the seventh century. And in those days there appeared in Alexandria a female philosopher, a pagan named Hypatia, and she was devoted at all times to magic, astrolabes and instruments of music, and she beguiled many people through (her) Satanic wiles. And the governor of the city honored her exceedingly; for she had beguiled him through her magic. And he ceased attending church as had been his custom…. And thereafter a multitude of believers in God arose under the guidance of Peter the magistrate — now this Peter was a perfect believer in all respects in Jesus Christ — and they proceeded to seek for the pagan woman who had beguiled the people of the city and the prefect through her enchantments…and they dragged her along till they brought her to the great church, named Caesarion…And they tore off her clothing and dragged her [till they brought her] through the streets of the city till she died. And they carried her to a place named Cinaron, and they burned her body with fire. And all the people surrounded the patriarch Cyril and named him “the new Theophilus”; for he had destroyed the last remains of idolatry in the city. It’s obvious John is drawing on the Ecclesiastical History written over 250 years before, but he tells the story through his own special lens. After Cyril died his See fell into the hands of a Christian sect known as the Monophysites. They evolved into the Coptic Church. 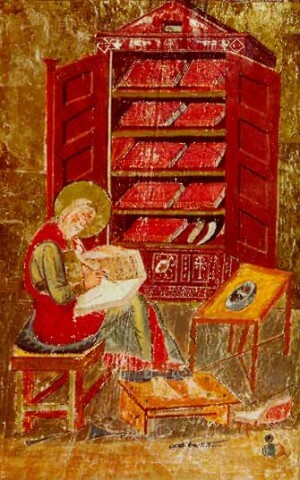 Cyril is revered among the Copts as one of their greatest saints and his relics greatly venerated. John, most likely, shared this view and adopted Cyril’s hostile attitude toward Hypatia. There are other fragments historians consider primary sources on Hypatia’s life and death, but they are brief and sometimes suspect. Professor Michael A. B. Deakin reviews the complete canon here and provides English translations in his book Hypatia of Alexandria: Mathematician and Martyr (Prometheus Books, 2007). Of the four sources I’ve reviewed, the first three are the most useful and diverse. Synesius gives us a loving image of his revered teacher; Socrates provides a balanced account of the politics and times; and Damascius recounts a new anecdote about Hypatia, possibly handed down from eyewitness accounts. John of Nikiu stands alone in his condemnation of Hypatia’s actions and approval of her murder, but his basic narrative differs little from Socrates and Damascius. Most people, who write about the distant past, whether in non-fiction or fiction, try to “get it right.” It’s hard when the sources are slender and the “facts” are disputed, but we try our best. I hope this essay contributes some additional knowledge to those who, like me, are fascinated by the life and death of this remarkable woman. Damascius makes her sound like a smart, powerful woman. I just got the Kindle version of Selene of Alexandria. Looking forward to the reading it. Damascius is definitely a fan. Thanks for getting Selene, I hope you enjoy it! Thanks for inviting me over for a read and it’s wonderful to meet someone else with a passion for Hypatia. She was a remarkable woman and it pains me that she is not more widely known today. She is a role model, not just for women, but for all of us. Thanks for checking out my blog. Yes, Hypatia was a remarkable woman. I’m so glad more people are finding out about her! Thank you for commenting over on my blog and giving me the oportunity to visit yours. Your post about the Hypatia sources have taught me much more about Hypatia and I love to learn. Whenever history tells us about women being supressed or I hear about it today I think about how our world would look like if women had always been allowed freedom. We could have had a cure for cancer and cities on Mars by now. I think society needs to be more aware of women especially in science. That’s the main reason why I from time to time post about some of the great women that live or have lived (primarily scientists). So glad you liked the post, Leif, and even more glad you highlight great women on your blog! As to the new book…thanks and enjoy! Thank you so much for all of the great info! I think your blog had the most complete information on Hypatia than any other places i have gone to.